In any civilized country the word “LAW” has its significant meaning but when the question comes to conclude the Indian Judiciary the debatable questions always arise. My fellow Indians abuse the law of our nation and sometimes they prefer to stay away from this country and they look forward for foreign opportunities. Like other citizens of different countries of the world, I also a great admirer of my nation but it doesn’t mean that I like to hide my country’s flaws or to flatter my country without having any glories and achievements. In my present writing I would like to conclude some eminent cases which has strengthen the route of Indian Judiciary in the core of this country and some cases which are/were the total miscarriage of justice. However it is not true that the miscarriage of justice was supported by all the learned Hon’ble Judges but sometimes justice was denied to common people by or due to absence/lack of majority. As we know majority plays an important role in a democratic country but sometimes it turns to bane and this is the current situation in the era of Legal Systen. 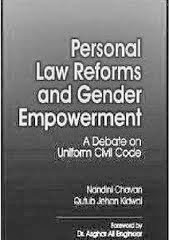 Long years ago a wakeup call was given to the Indian parliament by many eminent Judges & Justice Chdrachud reminded parliament several times to legislate laws related to UCC or form UCC in a country but it was ignored by the parliament and it remain unattended. However the draft was prepared at the time of Rajiv Gandhi Government and the tension, agitation and protest by the different different communities of Indian Society showed its anger towards UCC which was the communal war in India and proved that the religious hatred is in the blood of Indian Society, no legislation can eradicate such envy from India. And the draft remains incomplete and after the lapse of parliament sessions draft was just a mockery of Art. 44 of Indian Constitution. For such failure I will not blame Judiciary, Executive or legislative authority, I will blame public in General who are not ready to give up their own personal laws which sometimes compel judiciary to do injustice with the thousands of people who still prefer their personal laws which morally and ethically wrong and biased. It is a wakeup call to all my fellow citizens “please realize your Rights, perform your Duties and demand for your Laws as per the requirements of present society. Indeed Indian society is unique but sometimes unity of nation is the first priority over all personal needs.